THE ISLE OF BUTE lies between the mainland of Argyll and The Isle of Arran, one of a clutch of offshore summer resorts at the mouth of the River Clyde. It is so close to Glasgow... yet removed in style, nature and time by the stretch of water between Wemyss Bay (pronounced "weems") and Rothesay, the principal place on Bute. Wemyss Bay lies on the A78 coast road between Glasgow and Ayr, and is connected by rail to Glasgow International Airport and Glasgow Central Station. There is a fastbus 585 linking Wemyss Bay to Prestwick Airport, home of the dreaded RyanAir. Two fine new car ferries sail over to ROTHESAY in half an hour, and share the harbour with fishing boats and sailing yachts. An historic castle is the centre to this once proud Victorian seaside resort, but today as in many candifloss,bucket and spade towns a new atmosphere of lethargy has developed. However, Rothesay does provide the infrastructure of schools, supermarket, cinema, and the all-important ferry that enables the mostly retired population to live comfortably. Out of town, The Isle of Bute displays its true beauty. Rolling green countryside with copse and woods, inland freshwater lochs stocked with pike and trout, golf courses with stunning views, panoramic sandy beaches for horse-riding and seal spotting, lost coves and bays for the BBQ and boatman, and in the north of this isle (measuring just 15 miles by 5) a true highland wilderness. At Kames Bay in the north, the village of PORT BANNATYNE has a modest sailing marina which attacts many visiting yachts as they cruise the protected waters around Bute. There are over-night facilities and a very helpful boatyard for repairs and storing craft in the winter. The marina is linked to Glasgow Pacific Quay by flights of Loch Lomond Seaplanes on an ad hoc basis, journey time 17 minutes. The village has enough to amuse the yachties: a fish and chip shop, Post Office, two pubs and an upmarket restaurant The Russian Tavern, which also has four budget guestrooms. There is an ancient eccentric golfcourse with stunning views of hills, mountains, islands and seascapes in all directions. Petanque is played on the pitch close to the marina and boules may be hired at the Post Office. The coast road from Port Bannatyne Marina ends at a lesser ferry terminal where a ten-minute crossing will take you onto the Argyll mainland at Colintraive. Buses go this way, and many backpackers and hikers find that The Isle of Bute is an ideal stepping-stone from the Scottish mainland into the western highlands and islands. From the little port of Wemyss Bay, (pronounced "weems") proud new ferries sail across to Bute in just thirty-five minutes, a half hour of dramatic scenery peering across the sea to islands and mountains. The ship ties up in Rothesay, a huddle of old-time bakers, butchers and grocers around the grey stone walls of the 9th century castle. Right by the ferry terminal is a long low building housing a shrine to Victorian ablutions, all marble urinals, porcelain Water-Closets and cast-iron flushing cisterns. Here you can relieve yourself in glorious imperial splendour! Outside, along the seafront, well kept gardens divide town from beach for the veterans to stretch their legs and sniff the blooms. Fountains sparkle among palm trees, quite a surprise at this latitude, but evidence that the warm waters of the Gulf Stream still lick the west coast of Scotland. Behind the promenade park, a line of freshly painted villas, the same vintage as the public toilets, display their home-painted signs declaring "B&B" and "Guesthouse." Hanging baskets of flowers and tubs of shrubs dress the columns of each doorway where Mrs. McClusky or James Cameron fuss over the new arrivals that have come over from the mainland for the weekend. Tea needs to be drunk, and a game of golf before dinner, just up the hill from Rothesay. Saturday night in Rothesay is not over until the visitor has slipped into a narrow bar on the main square that lies just in front of the ferry harbour. It's difficult to move along those already sitting at the bar, but the entertainment is about to begin, and the action takes place at the far end. Finally a beer is procured, a niche is leant into, and the performance starts. A heavily painted lady sits on a stool pressing a microphone onto her lower lip. From the loudspeaker a full orchestra that would do credit to Frank Sinatra, fills the room. The lady sings, and is joined by a heavenly choir from the depths of the electronic machine. There is not a dry eye in the place. Some leave to use the Victorian toilet. It needs only the Marx Brothers to crash in! They probably did, after I left. The seagulls wheel as the scarlet painted open-top double-decker bus departs from the town square at 11 a.m., slowly passing the line of boarding houses into the green country beyond. The excited families are on a circular tour of the island, and the driver is demanding their attention to right, then to left, so that not a church spire or a basking seal can escape the massed ranks of digital photography. At twenty miles per hour they cruise into Port Bannatyne, a yacht and fishing harbour where a new marina has been built providing easy parking for over a hundred yachts in calm waters with scenery of loch, mountain, islands and seascapes. The marina is linked to the Pacific Quay in Glasgow by flights of Loch Lomond Seaplanes taking just some 17 minutes. Right by the fishermen's pier there's a stone-built village inn, run by a Russian family as a Russian Tavern, with beer poured from casks up on the bar, a piano, games of chess and cards, and a family atmosphere where good grog and vittals are taken for granted. Upstairs they have four guestrooms for tired sailors, homeless hikers or those who accidently pass this way. The bus pulls up the hill from the masts of the marina, past Kames Castle, a fortified Keep a thousand years old, previous home to the landed Bannatyne family that built the village back in 1810 A.D out of local stone and slate. The village remains much as it was then. Now on, through ancient farmyards and tiny fields where the cattle graze around prehistoric Standing Stones, even now aligned to points on the horizon where the sun will set on midsummer's day. Ettrick Bay comes into view: a bight of sand a mile long with not a sunbed or parasol in sight. A family could play all day here and not see another soul. Before buses came this way visitors were taken to this sandy beach by a tram, first drawn by horses, then electrified. But no trams have rattled along since 1928 and all that remains is the old tram station now used as the bus garage. Except, that is, for the tram-track, built as solid as a Victorian railway for in fact that is what it was. Part of the track has become pavement next to the road, but from graveyard high above Port Bannatyne the tramway remains and has been upgraded into a very useful hikers' trail from Port Bannatyne to a little tearoom at the north end of Ettrick Bay. Ettrick Bay is on the west of this island, and from here across the water the mountains of Arran rise straight from the sea into the heavens. The journey takes the bus riders south along the west coast, past forest, St. Ninian's Bay full of cockles and razor clams, and onto Scalpsie Bay. The Bay itself can only be reached by crossing two fields full of baby lambs, and breaking through a hedge of blackberry brambles onto the sand. The young and fit jump into the sea here, not to ride the waves, but to swim with the seals, as Scalpsie is home to over two hundred of the creatures, almost as tame as dogs. Towards the south of the island the bus will drop off the discerning visitor to walk around and marvel at one of the finest historic houses in Scotland, Mount Stuart House. It was here that the daughter of Paul McCartney of Beatles fame was married in the marble chapel, part of the building. The Victorian Marquis of Bute was one of the wealthiest men in the British Empire and spared no cost to bring about this magnificent Gothic masterpiece. As a Catholic and a Mystic, his house echoes to his beliefs and faiths, from marble chapel to stained-glass windows depicting the position of the stars at the time of his birth. Around the house, two hundred acres of parkland display mature trees brought here from all parts of the world. A couple of miles from Mount Stuart, where the island tapers off to its southern point, is the village of Kilchattan Bay. Just a string of white-washed cottages along the sandy beach where girls on ponies bounce about cantering, or jogging, or both. Standing back from the lane is another glorious Victorian folly, St. Blanes Hotel. Inside the fancy facade, a faded tartan carpet leads into a bar area dominated by a billiards table. Despite the fabulous views through the twelve feet high sash windows, locals crawl around the table hitting ball against ball oblivious of their unique location. Outside, at the end of the village lane, a track takes the adventurer towards the rocky outcrops of the south, and on its western flank the ruins of the 6th Century St. Blanes Chapel, where gravestones cut with runes mark the resting places of Viking Christians. From southern tip to the highlands in the north, and a return hairpin bend to the village of Port Bannatyne, runs a hikers' trail, The West Island Way. Some fifteen miles or so, The Way takes the pilgrim through pasture and forest, past Loch Fad where anglers hire a boat to fish the pike, perch and trout, and up onto moor and bog. The ospreys dive the loch to take their share of the fish, buzzards soar in the clear air, and tiny wrens twitter in the hedgerow. Onto the highlands, where the going gets tough, heather grabs at the feet, and the midges and mosquitoes make their presence felt. Up here is where Richard Attenborough the film director, that's Lord Attenborough to you and me, has his domain, with a fine farm and barns converted into guestrooms for the acting elite. Here too, the deer have their home raiding the sweet grass of the lowlands early each morning. Wild goats, large hares and mythological creatures too, prefer this neck of the woods. The dolphins and porpoises jump as the ferry takes the revitalized stranger back to the Scottish mainland. Bute has the ability to recharge the frazzled urban dweller with its unadorned pure nature and old-fashioned ways of the few permanent residents. It provides no amusement parks or watersports centres, no football stadiums or theatres. It has no package-holiday hotels or retirement estates, few modern facilities of any kind, yet it's attraction and beauty remain today as they were for the Viking, and long before, the prehistoric men who raised the spooky Standing Stones. Come on over, we'll have a beer! Or two! Tastes vary widely of course, and one man's favourite haunt is castigated by his neighbour. The West End Fish and Chip shop in central Rothesay serves Haddock and Chips in adequate style if that's your delight. There's Indian and Chinese takeaways too, cheap and cheerful. Plenty of caffs and coffee bars with decent coffee. In Rothesay itself head for: BRECHINS BRASSERIE at 2 Bridgend Street near the Fish and Chip shop. The food is imaginative and freshly cooked, and very well priced.Licenced. CHANDLERS claims to be the only fine dining on Bute, and their dining room is very fine indeed.The cooking belongs to the cuisine expected by the Scottish in a good hotel and is finding its traditional market.Chandlers 01700 505577. Before you get to Chandlers, on the coast road south from Rothesay, is The Pierhouse, on the old boating pier at Craigmore. Fine views and straight-forward good meals at a fair price. 01700 502867. THE RUSSIAN TAVERN at THE PORT ROYAL HOTEL in PORT BANNATYNE towards the north of the island is invariably occupied by French and Italian tourists, day-tripping gourmets and urbane professional types. All the food is fresh and local, they have their own fisherman, and the Russian Chef is totally uncompromising. Both CAMRA and Les Routiers independently have awarded them Scottish Pub of the Year. There are Russian wines, beers and vodkas, and local Real Ales served direct from the cask. Booking vital: 01700 505073 MENUS on Bute Hotel Website Five guest rooms. 50 yards to the marina. The ferry service from Wemyss Bay which is a short car or train ride north from Glasgow is the popular way of reaching this island. It operates throughout the day during summer season and a 30 minute ride would take you to the mainland from the island. The shorter ferry crossing from Colintraive on the Cowal Peninsula to Rhubodach near the northern tip of Bute is a nother option. The official Caledonian Macbrayne website lists all the current ferry timetables in detail. Tel: 01475 650 100. West Coast Motors operate a local bus service and you can view the timetables on their website. They also have Open top bus tours in summer which operate a circular tour from Rothesay. Tel: 01586 552319. Taxis are good travel options to explore the island at your pace. Bute is easily accessible from Glasgow. Take a train from Glasgow Central to the ferry terminal at Wemyss ["weems"] Bay (1 hr 10 mins), and from there it's a 35-min crossing to Rothesay. Those arriving at Glasgow International Airport can take the shuttle bus (ten minutes) to Paisley Gilmore Station, where there is an hourly direct train to Wemyss Bay. Those arriving at Prestwick Airport (RYANAIR) can take Fastbus 585 direct to Wemyss Bay. WEMYSS BAY lies on the A78 coast road from Glasgow to Ayr. There are also buses to and from Rothesay into Argyll, which link into a whole network of minibuses throughout the western highlands and islands. There are only one or two a day, leaving early morning and returning later, so for times, contact Western Buses now part of Stagecoach Group Tel. 01292 613 500. WEMYSS BAY TO ROTHESAY ferries sail daily every 45 mins from 0715 till 1945 (later on Fri, Sat and Sun). For times, Tel. +44 (0)1475 520521. There's also a ferry to Rothesay from Brodick on Arran (2 hrs), once a day on Mon, Wed and Fri in the summer only. Bute can also be reached from the Cowal Peninsula. A small car/passenger ferry makes the 10 min crossing from Colintraive to Rhubodach, at the northern end of Bute, daily every half hour or hour; from 0530-1955 Mon-Sat and 0900-1955 Sun in the summer (21 Apr-27 Aug). The Western Buses service around Bute is fairly good, though limited on Sundays. The best way to see Bute is by bicycle, and there is a bike-hire shop close to the ferry terminal. The island is fairly flat and the roads are quiet and in good condition. Buses connect with the arriving ferries at Rothesay and run to: Mount Stuart (hourly; 15 mins),Port Bannatyne and the Marina (every half hour on the quarter-hour,) Kilchattan Bay (4 daily Mon-Sat, 3 on Sun; 30 mins) and Rhubodach (1-2 daily Mon-Sat; 20 mins). There is an open-top double-decker that slowly circumnavigates the island, leaving Rothesay at 11.00am amd 1.00pm during the summer. Early morning, and in the afternoon there is a bus that heads to the north of the island, and over on the minor ferry to the Argyll mainland. On it's way to Dunoon it meets with our buses so that its possible to go to Tarbet, the isles of Arran and Islay, and other isles or up to Oban. Ask any bus driver for the latest time-table for COWAL. Bute is a pretty little island off the west coast of southern Scotland. A popular holiday destination since the Victorian times, Bute hasnt changed much even now. From the hills in the north, to lots of sandy beaches, ruined chapels and forts and an impressive activity list featuring soem of the most popular options like yachting, fishing and golf, Bute receives tourists all round the year. Pony trekking - Kingarth Trekking Centre - tel: 01700 831673. The capital of Bute and a popular sea side resort, Rothesay enjoys a pleasant climate all round the year. There are many historic edifices here including the circular Rothesay Castle with 4 round towers. The 16th century chapel dedicated to Saint Michael is located in the courtyard. take a peek into the local history, geology and wildlife here. It opens daily during the summer. Tel: 01700 505067. The guided walks on Tuesdays and Thursdays that start from here are quite popular among tourists. The Post Office Museum in Bishop Street ( free admission) is another must see. The award-winning restored Victorian Toilets on the pier form some of the most unusual sights in this island. Brandish Bute shop ( Phone 01700 504 971 ) makes a perfect stopover to pick up gifts and products made exclusively on the Isle of Bute. The Rough Guide to Scotland provides good independent advice, as does London based TIME OUT. Lonely Planet is the american publication of choice. In Rothesay the Tourist Information Centre occupies The Winter Gardens on the Promenade, in Rothesay, Tel. 502151. Open Apr and Oct Mon-Fri 0900-1730. One of Bute's main attractions is Mount Stuart, a unique Victorian Gothic house set in 300 acres of lush woodland gardens, three miles south of Rothesay. This magnificent architectural fantasy reflects the Third Marquess of Bute's passion for astrology, astronomy, mysticism and religion, and the sheer scale and grandeur of the place almost beggars belief. This is truly one of the great country houses of Scotland and displays breathtaking craftsmanship in marble and stained glass, as well as a fine collection of family portraits and Italian antiques. 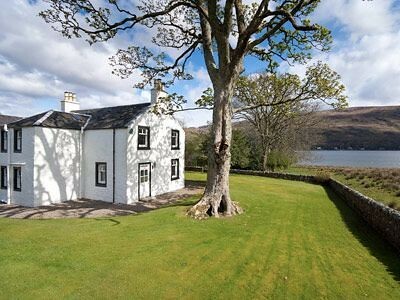 Much of the existing house dates from 1877, and was built following a terrible fire which destroyed the original, built in 1719 by the Second Earl of Bute. May-Sep Sun-Fri 1100-1700, Sat 1000-1430, gardens 1000-1800, house 1100-1700, £7.50, concession £6, children £3.50. Equally impressive are the landscaped gardens and woodlands, established by the Third Earl of Bute (1713-1792), who advised on the foundation of Kew Gardens in London. It's worth spending a whole day here in order to take in the amazing splendour of the house and to explore the beautiful gardens. And if the weather's fine, why not bring a picnic and enjoy the wonderful sea views. It is also equipped with audio-visuals and restaurant. Easter weekend and 1 May-17 Oct daily except Tue and Thu. Gardens open 1000-1700; House open 1100-1630. A regular bus service runs from Rothesay to the gates of the House. There is always something different and interesting to do on Bute! There are a series of weekend events, starting on the very first weekend of May when jazz enthusiasts gather for a jamboree of music making using venues throughout the island. BUTELIVE is a similar music festival for the rock and pop fans held on the second weekend in July. BUTE HIGHLAND GAMES is on the third weekend of August. PORT BANNATYNE has a fine golf course with visitors' facilities phone 01700 504544. Port Bannatyne Petanque Club has three piste on a seafront pitch just north of the marina. Telephone: 01700 503338 http://www.portbannatynepetanque.org.uk Boules may be hired from the Post Office. There are three other golf courses on the island, the largest above Rothesay, phone 01700 503554. SEALS, BIRDLIFE and WILDLIFE abound and you will have no difficulty in watching wild deer and hare. The seal colony is at Scalpsie Bay and Port Bannatyne is frequently visited by porpoises and dolphin. The huge Basking Shark often visits boats offshore. Southwest of Kilchattan Bay is St Blane's Chapel, a 12th-century ruin in a beautifully peaceful spot near the southern tip of the island. The medieval church stands on the site of an earlier monastery, established in the sixth century by St Blane, nephew of St Catan, after whom Kilchattan is named. The ruin can be reached by road from Rothesay, or as part of the walk from Kilchattan Bay. Four miles north of St Blane's, on the west coast, is Scalpsie Bay, the nicest beach on the island and a good place for seal-spotting. A little further north is St Ninian's Point, looking across to the island of Inchmarnock. At the end of the beach are the ruins of a sixth-century chapel, dedicated to St Ninian. The Highland-Lowland dividing line passes through the middle of Bute at Loch Fad, which separates the hilly and uninhabited northern half of the island and the rolling farmland of the south. The highest point on the island is Windy Hill (913 ft) in the north, from where there are great views across the island. A less strenuous walk is up Canada Hill, a few miles southwest of Rothesay, above Loch Fad. Walk along Craigmore promenade and turn off at the old pier to Ardencraig Gardens. Then continue uphill along the golf course to the top of the hill for great views of the Firth of Clyde. Until 1928 there was a tram linking Rothesay to Port Bannatyne then to Ettrick Bay on the west coast of the island. Today a bus replaces the tram, but the old tram track has been renovated into a fine hiking trail. From Rothesay walk north along the seafront to Port Bannatyne Marina (about three miles,) then take the road to the left going uphill west, there is a good pavement. To your right over the fields you can see KAMES CASTLE. When the pavement runs out, just before a grand roofless stone church (and the graveyard,) the tramway leaves the road and runs alongside all the way to Ettrick Bay. In the field to the left as you approach the bay you can see prehistoric Standing Stones. From Port Bannatyne to Ettick Bay is over two miles. The island holds its own Highland Games on the last weekend in Aug. There's also the Isle of Bute International Folk Festival and World Ceilidh Band Championships, a massive festival of music and dance held over the third weekend in Jul, and the Isle of Bute Jazz Festival, during the May Bank Holiday weekend. The Bute International Guitar Festival in September brings together some of the finest exponents of guitar from all over the world. The two-day event Festival of Cycling or `Rothesay Weekend’ in September is another important event in the festive calendar of Bute. Golf: The most interesting and ancient 13-holes course on the island is at Port Bannatyne, a sailing village just three miles north of Rothesay on the coast road. The views are truly stunning, to the south: forest, to the west: across the sea to the high mountains on the Isle of Arran, to the north: Bute's own highlands, wild and wooly with deer and goats, and the east: the stone-built village of Port Bannatyne with its yacht marina, Kames Castle, and over the sea to the Argyll hills. The course is up and down the spine of the island, and the clubhouse is just west of Port Bannatyne. Visitors are most welcome, and the fees are very reasonable. Rothesay Golf Course, Tel. 01700 503554, scenic 18 holes with great views at Canada Hill, just outside Rothesay. Pony trekking: Kingarth Trekking Centre, Kingarth Old School, Kingarth PA20 9LU. Telephone 01700 831673 Kingarth Riding Club: 01700 831256 these stables at Kingarth cater for all levels of rider and take visitors around the very beautiful southern end of the island. Fee is very reasonable. PONY CLUB: 01700 505306 Rothesay Riding Centre, at Ardbrannan Farm, Canada Hill, Tel. 01700 504791. Petanque: The Port Bannatyne Petanque Club was formed in 2008 with three pistes on a pitch just north of the sailing marina, on the seafront. Boules may be hired from the Post Office. WEBSITE: http://www.portbannatynemarina.co.uk For rates and charges, advice, local weather and tides. 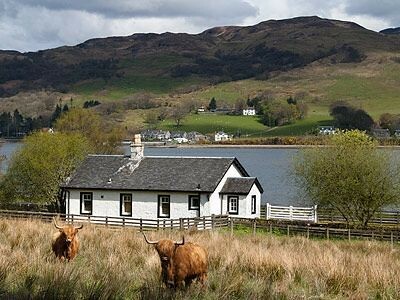 The island has many types of accommodation, from historic houses to hire by the week, holiday cottages, bed and breakfasts, hotels of all sizes and holiday flats. There is one hostel on the island, on the seafront 50 metres north of the ferry terminal, http://www.butebackpackers.co.uk It is newly refurbished and provides economical accommodation with good seaviews. Phone 01700 501876 There is a caravan park on a hillside outside Rothesay where a chalet or caravan can be booked for the week.Phone 01700 502048. Camping is generally discouraged except during the motorcycle rally at the end of August, when the recreational ground at Port Bannatyne in North Bute, close to the Marina, becomes home to a thousand tents. These past couple of years the rally has been cancelled after an unfortunate accident with the loss of a life. AT THE NORTH OF THE ISLAND at PORT BANNATYNE, and serving the many visiting sailors and wildlife enthusiasts, is THE PORT ROYAL HOTEL. 5 unpretentious guest rooms at economic prices. Phone: 01700 505073 visit http://www.butehotel.com Chosen by those keen on Real Ales and the four star Russian cuisine. Fifty yards to the marina. Own fisherman supplying fresh fish daily. At the northern end of Port Bannatyne, beyond the yacht marina, lies Kames Castle, a magnificent ancient fortified tower with extensive gardens and estate. 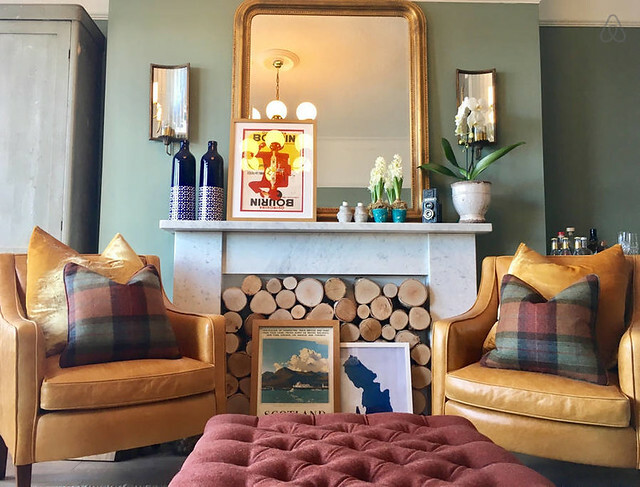 Within the grounds are tasteful period cottages which are rented by the week to holiday makers, and for a family provide a good alternative to a hotel. 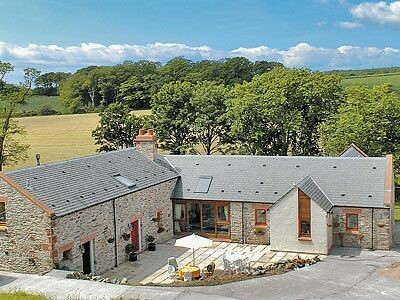 Visit: http://www.kamescastlecottages.co.uk With many benefits of using the grounds and garden, they are also very strict at preventing visitors...so no parties!